Your dual band Intel(R) PRO/Wireless LAN Mini PCI Adapter works with either 802.11a or 802.11b wireless standard. Operating at 5 GHz (802.11a) or 2.4 GHz (802.11b) frequency at speeds of up to 54 Mbps using 802.11a you can now connect your computer to high-capacity 802.11a networks using multiple access points within large or small environments, and also to existing 802.11b networks. All your wireless client connections can be easily managed by the Intel(R) PROSet for wireless utility to create profiles using the Profile Wizard. Enhanced security measures using 802.1x, WPA, and 128-bit WEP encryption is standard for both 802.11a and 802.11b. I am recently working on a DELL inpiron 8600. 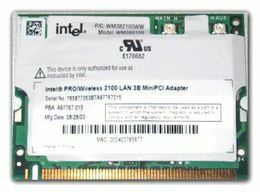 Would like to know the process for setting up the wireless conection ussing the Intel PRO/Wireless LAN 2100 Mini PCi. Is there a need for an external device other than the internal card installed by manufacturer?